This Saturday, March 31, the Armenian Church commemorates the Raising of Lazarus as told in the Gospel of John, Chapter 11. Lazarus and his sisters Mary and Martha were good friends of Jesus. Their home in Bethany (near Jerusalem) was Jesus’ home whenever he was in Jerusalem. Lazarus’s sudden death threw his sisters into deep mourning. Jesus also wept for his friend. 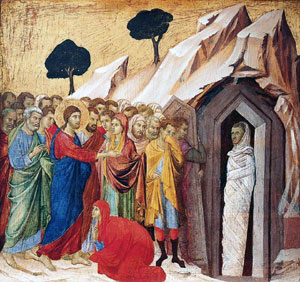 John’s gospel account emphasizes the fact that Lazarus was indeed dead by pointing out that his body was in the tomb. Jesus’ raising of Lazarus convinced many people of his unique powers, and according to John, the authorities took steps to try to silence him. Lazarus personifies the whole of humankind and Bethany represents the whole world. Lazarus Saturday is the real beginning of the Cross. Its major themes are the forthcoming victory of Christ over death, the supreme sacrifice of love, and the resurrection as the ultimate triumph of love. A hymn traditionally sung on Saturday evening (eve of Palm Sunday) says: “With the raising of Lazarus by which the dead were given hope, the descendants of Adam were also raised….” Thus, as the Lenten period comes to an end, we are greeted by the hope of Christ’s promise of the resurrection of humankind. The forty days of Great Lent (Medz Bahk) come to an end with Vespers on the Friday prior to the commemoration of the Raising of Lazarus. A new fasting period for Holy Week begins on Monday and continues through Holy Saturday. Posted from Armenian Prelacy’s (Easter) E-Newsletter.